It is the mission of the Newington Elementary Children’s Center, Inc., to provide year- round, quality child care programs. Our programs incorporate standards of professional practice in early childhood development within a safe, nurturing environment. NECCI has operated as a non-profit organization for over thirty-five years. Our goal has been to provide cost- effective child care of exceptional quality for the children of Newington and nearby towns. 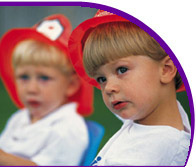 Our years of successful service are due in part to our goal oriented research based approach to child care. Our waiting lists reflect parent and community confidence in our staff, program, policies, and procedure. Over the years, NECCI has been able to maintain a volunteer Board of Directors comprised of individuals from diverse backgrounds (i.e. education, business, finance, healthcare, construction, etc.). One of the primary goals of the Board has been to manage the fiscal operation of the organization in times of recession, lean enrollment and, most recently, growth. We employ a seasoned, knowledgeable staff. Many of our employees live in the town of Newington and were raised here; a small percentage attended our existing childcare centers themselves as children. We also hire from neighboring Central Connecticut Sate University. Our program enables the families we service to be confident that their children are receiving childcare that exceeds guidelines established by the National Association for the Education of Young Children, The Hartford Association for the Education of Young Children, and the Connecticut Association for the Education of Young Children.